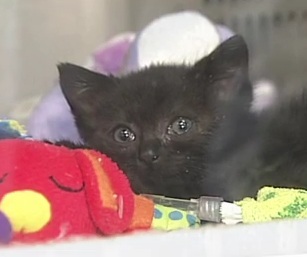 More on the story of injured little Tabitha kitten, with two informative video reports. For those who read last night’s story: Tabitha is much improved today. We posted last night on the plight of a tiny 13oz. kitten who has a rescue group, the group’s friends, two veterinary providers, and now the greater Albany NY community pulling for her as she tries to survive serious injury and being left to die. Tabitha Kitten Rescued from Dumpster, Fights to Recover in Oxygen Chamber tells the story of her being discovered, crushed and broken, by an apartment complex maintenance man as she cried out from within a plastic bag in a trash dumpster. Last night’s story also details the kitten’s care and the ups and downs of her condition since she was found on Monday. Tabitha was given to local resident Diane Metz and her rescue group Orange Street Cats, which was organized last year to perform a dramatic save of 90 cats from a monumentally decrepit and filthy home about to be demolished. To date Ms. Metz has assumed personal responsibility and put thousands of dollars in charges on her own credit card to assure that Tabitha receives the medical attention that will give her the best chance at recovery. The kitten is receiving care at Capital District Animal Emergency Clinic, in association with Upstate Veterinary Specialties. While last night’s report left off on a somber note as the kitten took a bad turn in the afternoon, she bounced right back and is now doing well. For now, she is doing much better and her signs are good. Medical staff periodically check to see whether the little cat is able to breathe without the assistance she gets in her oxygen chamber. While her injured lung may need attention, Dr. Sedacca says her rib fractures may heal on their own. Two local television news channels made reports last night and since each adds something different to the story, we include them both here. The CBS report includes encouraging commentary from Tabitha’s attending physician, Dr, Sedacca. We don’t ask that readers donate to assist with Tabitha’s care, but anyone who wishes to help can click the link to visit Orange Street Cat’s website, where they can either do so with a few clicks, or get information on donating otherwise. OSC asks people to please NOT call the veterinary clinic or doctor about Tabitha. WTEN News 10 met Diane Metz at the veterinary hospital on Thursday afternoon and made this report. CBS6 also reported on Tabitha.